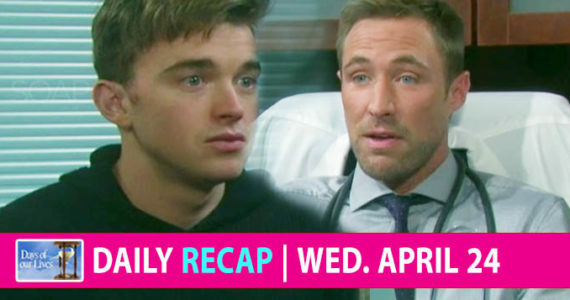 The Days of Our Lives recap for Wednesday, February 13 features Jordan proving she’s the crazy one in the family — and far more dangerous. But, has she always been this way and we just didn’t know. Eli (Lamon Archey) shared his doubts with Hope (Kristian Alfonso) about Ben’s (Robert Scott Wilson) guilt as Ben worried Hope might be right. Ben then had a hallucination involving Ciara, and Dreamt Ciara helped him figure out Jordan set him up. Eli overheard Ben talking to himself as he arrived to take him to lockup but Ben got a gun and pulled it on Hope. A newly-returned Rafe (Galen Gering) ran into Gabi (Camila Banus), who told him that Jordan (Chrishell Hartley) is back and acting weird with Kate (Lauren Koslow). Rafe left a message for Hope and went to find Kate. Meanwhile, Jordan told Kate she was going to make sure she’d never bother anyone again. Jordan returned to the cabin and told Ciara (Victoria Konefal) that Ben was arrested and then said she must die. Ciara begged for her life as Jordan said she was going to set a fire…again! Rafe arrived at Kate’s and kept knocking. After he left a phone message, he heard a noise and broke in and found an unresponsive Kate on the floor. John (Drake Hogestyn) asked Diana (Judith Chapman) if he’s Leo’s father, and she said yes. She saw no need to tell Leo and admitted he doesn’t know. Will (Chandler Massey) and Marlena (Deidre Hall) discussed patience with the Leo situation, and she told him about John’s past with Diana. Later, Marlena asked John if he learned anything about Leo. Leo (Greg Rikaart) pressed Sonny (Freddie Smith) to sleep with him or he’d send him and Will to prison. Gabi returned and Sonny spilled all. Gabi promised to help him be with Will as Leo returned and asked if he’d come to a decision. Sonny said he’d be right there, but Gabi arrived instead. Sonny ended up calling Will and asked him to be his Valentine.